Product reviews weren’t something I planned on doing when I started this blog. My plan was to try something new and to push myself to continue to try new things. 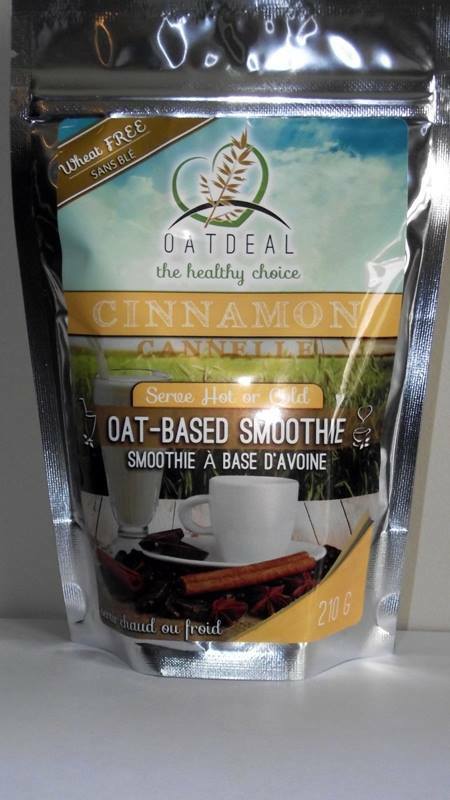 But, when I stumbled across @oatdeal on Twitter and read this article, by Robyn Tocker in the Western Producer, I decided I’d try my hand in product reviewing and help spread the word about this Saskatchewan made oatmeal smoothie. Reading this article, I was inspired by the fact that George Barreras didn’t give up on a his dream. Sometimes people forget that Saskatchewan produces wonderful products that are made right here. Oatdeal has been breaking into the market scene and if you check out their websites you will see they are quickly being scooped up by major chains. Look for these on a shelf near you! But, enough about the sales side….Let’s talk taste! Cinnamon, vanilla, and chocolate. mmmm I didn’t know what to expect from the hot oatmeal drink. Part of me expected the flavor to be very overpowering and extra sweet. I was wrong. If you enjoy oatmeal for breakfast, you will love these smoothies. Each blend has just a subtle taste of flavor. Even the chocolate. There is just enough flavor added to the oatmeal for the taste to linger on your tongue after you are done, leaving you wanting more. As I drank the hot cinnamon smoothie, I was reminded of Aunty Mary’s breakfast. I think the cinnamon would be excellent in a cold smoothie with peaches or bananas. The texture is very smooth, so it would blend nicely. I drank these three flavors as hot smoothies with just water, but they can be blended cold with fruit, or added to coffee! Being that it is winter in Saskatchewan, these make the perfect quick breakfast, or snack. After one for breakfast, I had no problem surviving until lunch without feeling overly hungry. Check out Oatdeal’s website and FB pages and remember to support locals. Oatdeal provided me with some samples, but all views are my own. Next One Year as a Blogger!